The verdicts are coming in. 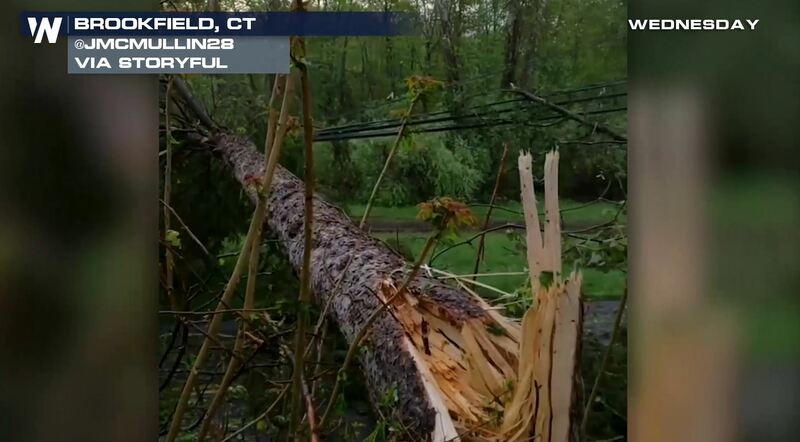 Some of Tuesday’s storms across the Northeast were officially macrobursts. Macrobursts are large swaths of damaging, straight-line winds. Many times you’ll hear us say “microbursts” which are (of course) smaller in size and impact. Macrobursts don’t come around all too often. All of the storm reports from Tuesday, May 15 where blue dots show wind damage and red show tornadoes. When storm surveys are conducted, meteorologists look at the way the trees were knocked over. A simplistic way of determining if a tornado hit is to observe if all the trees fell in the same direction, or are knocked on the ground in many, differing directions. More storm surveys will be completed across the Northeast with more conclusions. If we find anything interesting from them, we’ll pass it along!